We are on the eve of a great change in our conception of politics, such a change as has lately taken place in the conceptions of the political economists, the educators and the criminologists. The political economists used to think of man as a sort of Lone Wolf who went around bent only on feeding himself and his family. Political economy remained a dreary science until it began to study men, women and children as human beings with all sorts of complex motives and influences driving them in all sorts of directions. 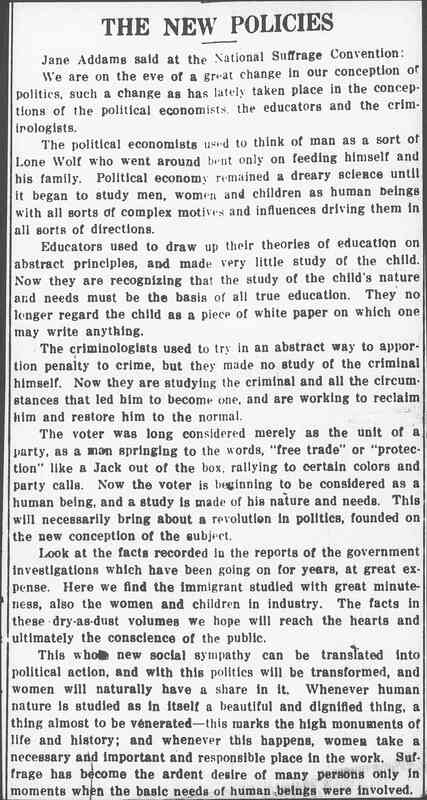 Educators used to draw up their theories of education on abstract principles, and made very little study of the child. 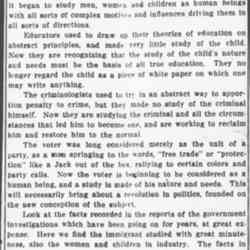 Now they are recognizing that the study of the child's nature and needs must be the basis of all true education. They no longer regard the child as a piece of white paper on which one may write anything. The criminologists used to try in an abstract way to apportion penalty to crime, but they made no study of the criminal himself. Now they are studying the criminal and all the circumstances that led him to become one, and are working to reclaim him and restore him to the normal. 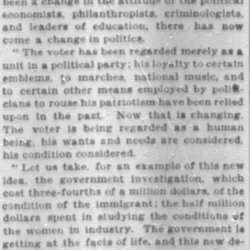 The voter was long considered merely as the unit of a party, as a man springing to the words, "free trade" or "protection" like a Jack out of the box, rallying to certain colors and party calls. Now the voter is beginning to be considered as a human being, and a study is made of his nature and needs. This will necessarily bring about a revolution in politics, founded on the new conception of the subject. Look at the facts recorded in the reports of the government investigations which have been going on for years, at great expense. Here we find the immigrant studied with great minuteness, also the women and children in industry. The facts in these dry-as-dust volumes we hope will reach the hearts and ultimately the conscience of the public. Take the great pioneer countries like Australia and New Zealand, where the women bear their full share in the economic and political life. Take Wyoming, where women were given full suffrage in 1869. The men and women shared together in the hard pioneer life of the early days. No one was ever more conservative than the Dutch when they went to South Africa, but the women trekked with the men and fought side by side with them, and the Dutch settlers gave votes to women. The Dutch ladies were conservative and seldom used them, but it illustrates the principle. Finland, Iceland and Norway, in their poverty, have still something of the pioneer spirit. The men and women work together. It is so also in the moments of great revolution. In the American Revolution women bore their full part; but unluckily afterwards the men, filled with the doctrinaire ideas of the eighteenth century, did not admit women to a share in the new government. 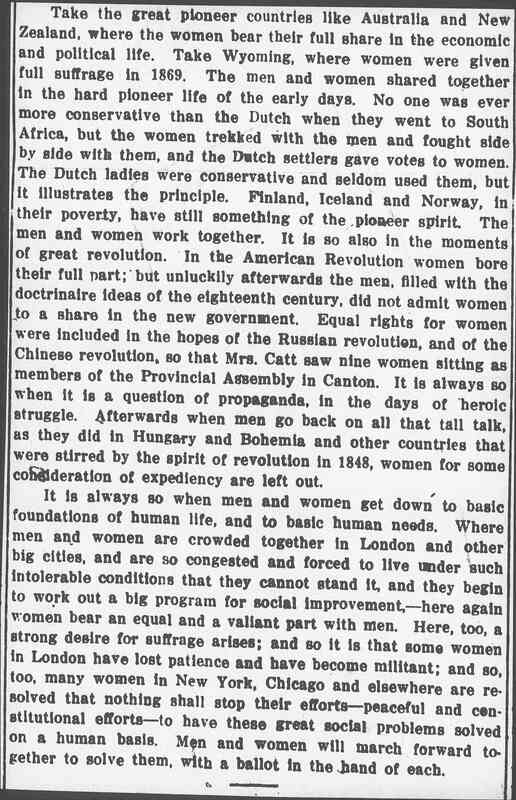 Equal rights for women were included in the hopes of the Russian revolution, and of the Chinese revolution, so that Mrs. Catt saw nine women sitting as members of the Provincial Assembly in Canton. It is always so when it is a question of propaganda, in the days of heroic struggle. Afterwards when men go back on all that tall talk, as they did in Hungary and Bohemia and other countries that were stirred by the spirit of revolution in 1848, women for some consideration of expediency are left out. It is always so when men and women get down to basic foundations of human life, and to basic human needs. Where men and women are crowded together in London and other big cities, and are so congested and forced to live under such intolerable conditions that they cannot stand it, and they begin to work out a big program for social improvement, -- here again women bear an equal and a valiant part with men. 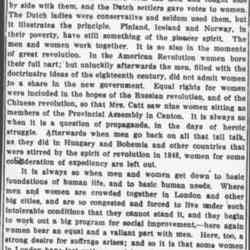 Here, too, a strong desire for suffrage arises; and so it is that some women in London have lost patience and have become militant; and so, too, many women in New York, Chicago and elsewhere are resolved that nothing shall stop their efforts -- peaceful and constitutional efforts -- to have these great social problems solved on a human basis. Men and women will march forward together to solve them, with a ballot in the hand of each. 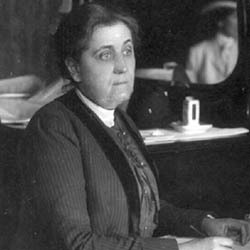 Addams' November 30 address at the annual meeting of the National American Woman Suffrage Association discusses the meaning of suffrage, the changing political climate, and the connections between politics and social improvement. 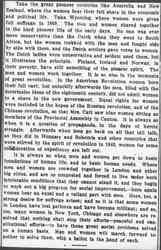 The New Policies, Woman's Journal 44 (December 6, 1913): 388. 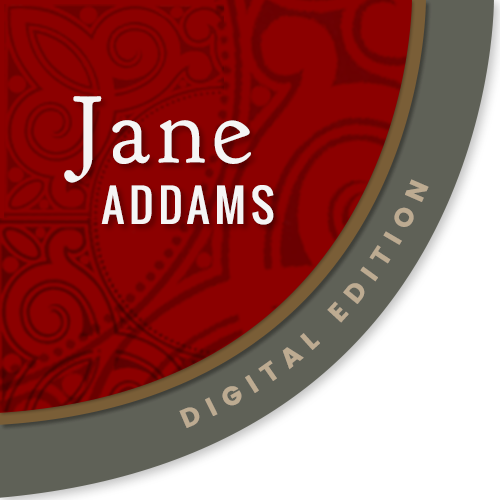 Addams, Jane, “Speech to the National American Woman Suffrage Convention, November 30, 1913 (excerpt),” Jane Addams Digital Edition, accessed April 23, 2019, https://digital.janeaddams.ramapo.edu/items/show/9019.